Why haven't more spacecraft/satellites been hit by debris? It is touted by the media that space is becoming more dangerous and risky due to an increase in space debris. Why haven't more craft been hit by the debris? I presume that it is not at a critical level yet. Do the space agencies have avoidance techniques or are the strikes not reported/not critical? They are hit all the time. It just hasn't been critical. So far. Looking at the outside portion of the Hubble WFPC2 camera after it was returned, I saw a huge number of large and small pits in the paint and underlying aluminum from debris hits. Below is an image of that surface after all of those sites were cored out for analysis. Note that the cores are much larger than the size of the damaged areas, but it at least gives you an idea of the number of hits. It was on orbit for 15 years. The size of the various things that can collide are 'small' relative to the amount of 'space' available. Increase the surface area, increase the risk of collisions. A tether experiment on the shuttle, that was 12 miles long, tore, possibly due to a collision back in 1996. The solar wings of the space station have recorded minor debris hits I think. 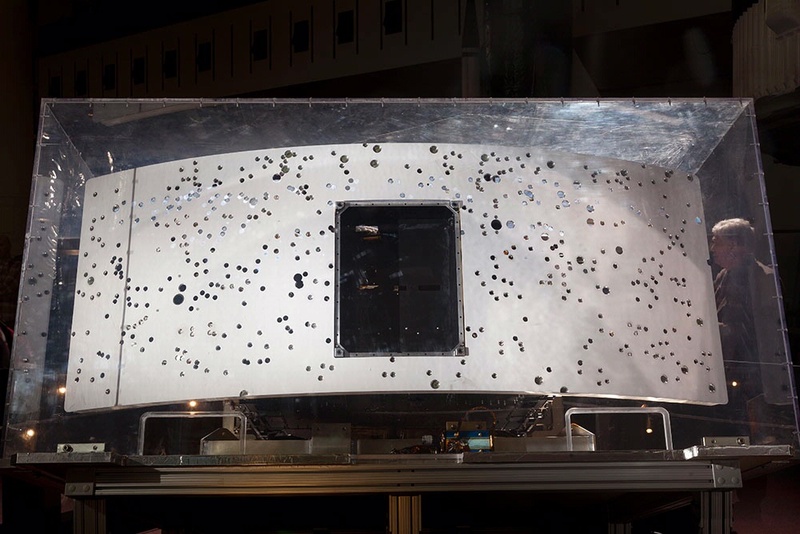 The shuttle windows have shown debris hits over the year, but very small ones that did not break through. As gerrit comments, space is really big. Satellites, in general are very small in comparison. The odds of two tiny things hitting each other in huge spaces is fairly low but not impossible. Thus the low number of hits. Alas, increase the number of objects, size of objects, and the probability goes up. According to this article -- http://www.space.com/5542-satellite-destroyed-space-collision.html -- there have been only 4 collisions with space debris as of 2009, only one resulting in a satellite being destroyed. I suspect there's a question of definitions there: collisions with tiny enough objects travelling in similar orbits (and thus at similar speeds, resulting in very low delta-v) could be barely noticeable. Which, I guess, leaves the question of whether the low "actual collision rate" is because the danger isn't really all that big, or because people are actively working to avoid collisions. Yes, space agencies (ESA in my case) can track objects larger than 10 cm. If there is the risk of collision, we apply a CAM (Collision Avoidance Maneuver). When an object is in orbit, all the other objects at its inclination and elevation will also be in orbit travelling the same speed; hence the 2 objects never meet. All satellites above it will be moving slower and ones below it will be moving faster to keep their relative orbits stable. The only serious threats to satellites are asteroids entering our atmosphere on a downward trajectory, but the odds that one of those collide with a satellite in orbit are, for lack of a less cliched term, astronomically low. As far as human-made debris getting trapped in orbit? There's really not much of it. Booster rockets are discarded and fall harmlessly into the atmosphere. So outside of some small decoupling bits or maybe even tools dropped by astronauts doing EVAs in orbit there's very little to worry about. Not the answer you're looking for? Browse other questions tagged spacecraft debris or ask your own question. How are astronauts able to spacewalk in safety, despite all the debris? Is there any possible way to reduce the cost of a manned mission to the Moon? Has any man-made satellite or space vehicle ever been hit by a natural meteoroid? Can orbital debris be assembled into a module for space exploration? What is the smallest object that would survive a reentry from LEO? What would it be made of? How is the Hubble main mirror protected from debris? Space Station Battle: Could the Almaz gun depressurize the ISS? Why haven't telescopes been sent to other planets? Why aren't there many audio soundscapes recorded within the spacecraft? How would a laser “shoot down” space junk?